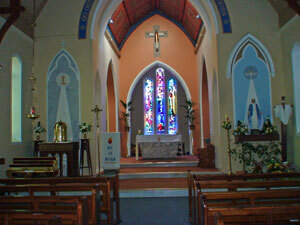 Following the installation of a webcam in St Joseph’s SMA Parish Church, Blackrock Road, Cork, it is now possible for former parishioners [as well as SMA members] to watch from the comfort of their own home – in Ireland, Africa, Europe, UK, USA, Australia – the different ceremonies throughout the year. According to the Parish Priest, Fr Noel O’Leary SMA, when he presented this proposal to the Parish Council and the Parish Finance Committee they were enthusiastic about it. Having the webcam will allow people to keep in touch with what’s happening in the parish. With Christmas approaching going online has proved timely so that those far from home can link back to Blackrock Road wherever they are. Housebound – will allow the housebound in the parish to follow the different regular celebrations – daily and Sunday Mass, Adoration of the Blessed Sacrament, the daily Rosary before 10am Mass… It will also allow them to ‘attend remotely’ the baptism, wedding and funeral ceremonies. Grandparents – will be able to watch the monthly Childrens’ Mass or the Crab Lane Primary school events – Christmas Carol Service, enrolment for First Holy Communion, Confirmation etc. To view the webcam click here.